I had no idea that huge Afro hairdo was a wig during the 1970′s when Billy Preston and his clavinet seemed omnipresent. Like no idea at all. Instead, I just became mesmerized by his seemingly effortless keyboard funk, possibly requiring the word chops be applied to a musician’s style for the first time. The whole sound and image kind of outdid Sly Stone for me. Sans the seediness, which as it turns out was all there, he was my black Elton John, with the shiny pastel clothes, those glam meets Blaxploitation spade shoes and all the remaining trimmings. 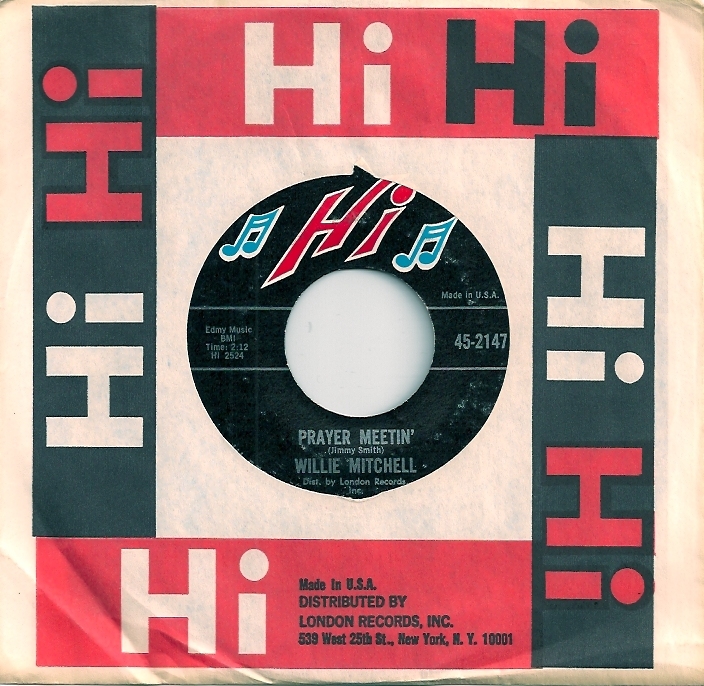 Once I started researching his past, actually around the time of his Apple Records singles, I discovered his early mod organ releases with their wonderfully suggestive titles luring me in, for example THE MOST EXCITING ORGAN EVER and WILDEST ORGAN IN TOWN. Wow, these albums were right up there with Jimmy McGriff and Jimmy Smith, Brain Auger as well. Like some of his contemporaries, he caught the musical ear of various British acts resulting in both recording and touring partnerships. Most notably were The Rolling Stones, who he worked with throughout the 70′s, all the while donning that fantastically oversized Afro wig. Then there were The Beatles, adding keyboard magic to yet another of their rather dull songs, ‘Get Back’, turning it into something special. Certainly for me the highlight was always his electric piano solo midway through. As soon as it finished, I dove for the dashboard to switch the station. 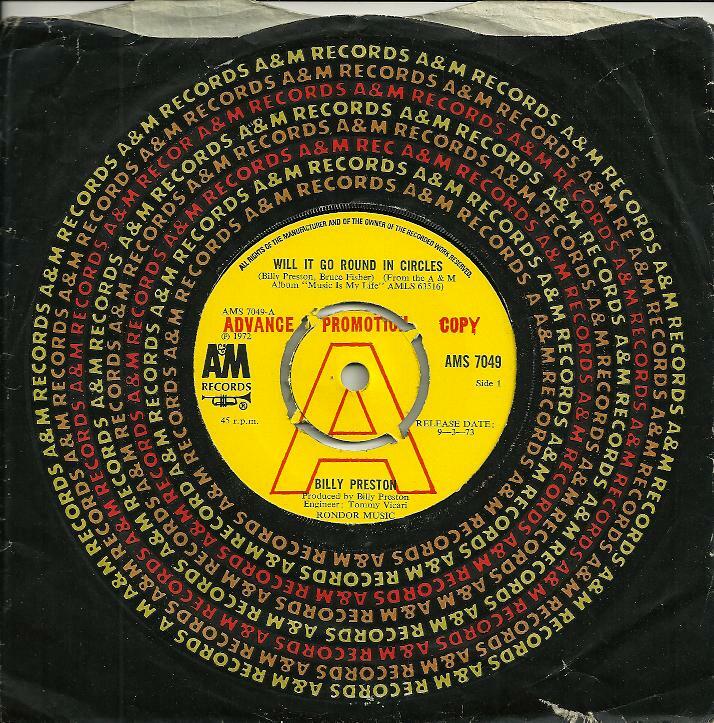 During his most successful mid 70′s stretch came the A&M years, and several huge singles including ‘Will It Go Round In Circles’. 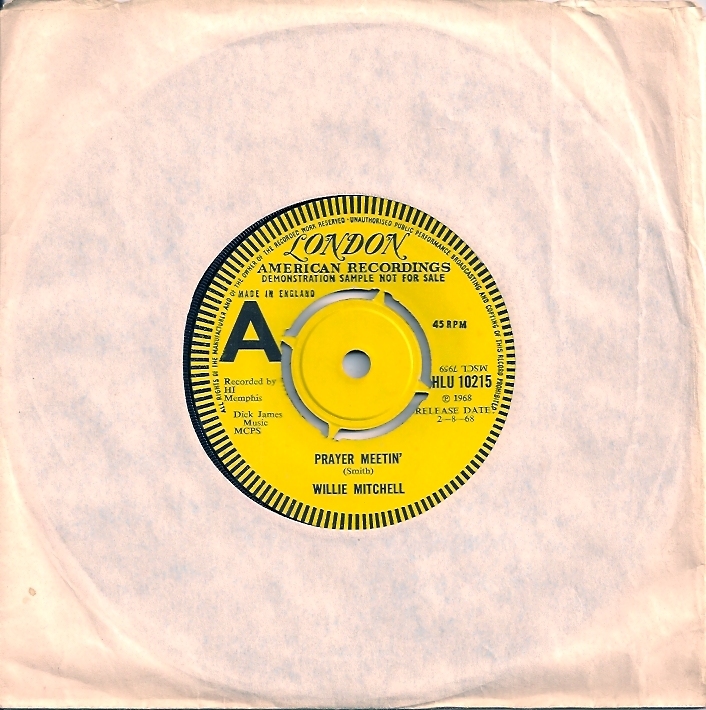 Although a US #1 during ’73, the record never charted in the UK despite heavy airplay on the BBC that summer. I mean, seriously, I was there and know for sure, it was played constantly. Maybe too much, because as a possible result, no one needed to buy it. Seems Willie Mitchell had that soulful teen dance thing down, not too ghetto but just right. 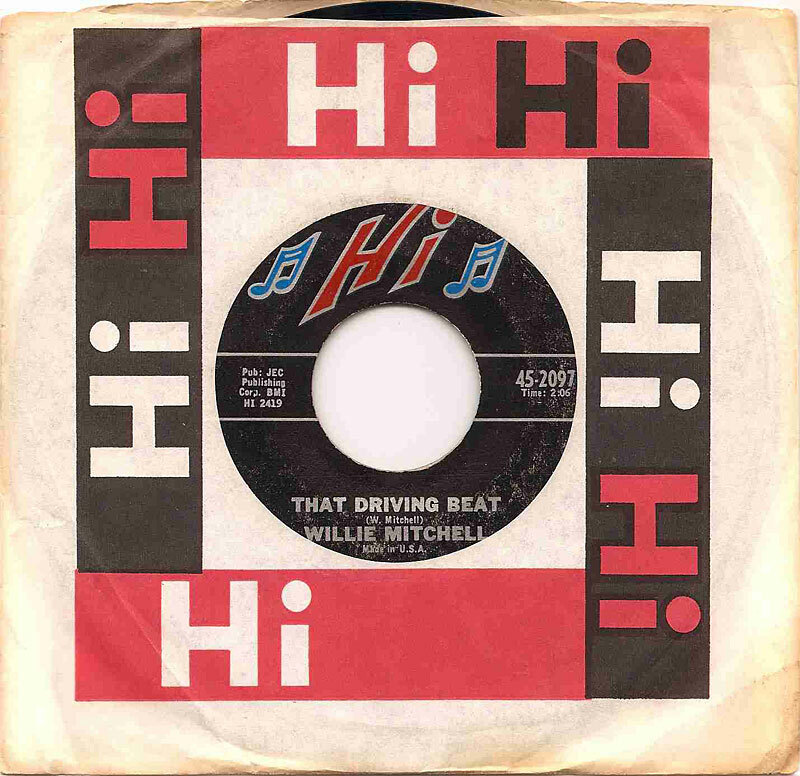 ‘That Driving Beat’ is one of the few he’s ever released with vocals, to my knowledge, and I’ve got about thirty of his 7′s. Admittedly not sure if it’s the man himself or one of his Hi rhythm section doing the singing, but it’s way hot. Check out the ‘Satisfaction’ riff in there too. 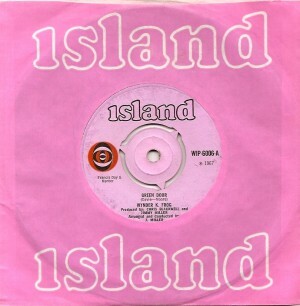 The single’s featured on many UK comps, being a well liked Mod track back in ’65 too. ‘That Driving Beat’ was exactly that, a purple hearts eye opening bumper. You can see why it became a favourite. I actually got to hear Willie Mitchell regularly on my local Top 40 station in the 60′s. Yeah, for some reason WOLF always played his singles. Mind you only for a few weeks, just enough to chart in the 30′s then off (click on the WOLF survey above to enlarge and have a look). 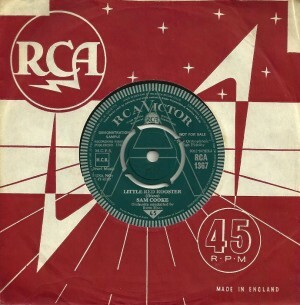 Maybe they did it for flavor or favor, the station did play a lot from London Records and their imprints. Lucky me. 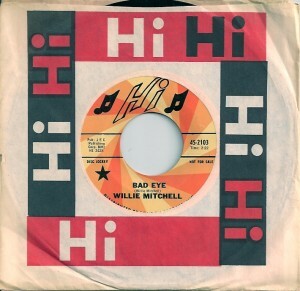 I took interest in the Hi Label as well, being part of London Records, one of my favorites. 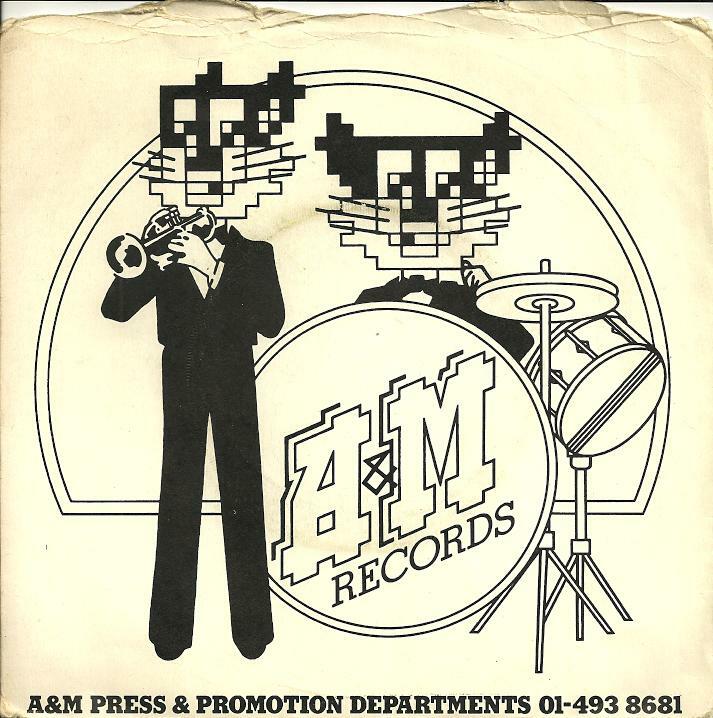 This led me to check out their other acts, thereby discovering Ann Pebbles, O. V. Wright, Otis Clay and Al Green, all of whom Willie Mitchell produced. His singles never ever disappoint. If you see them, buy them. And then buy a jukebox to put them in. Best money you’ll ever spend. 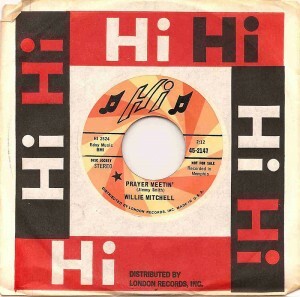 Willie Mitchell’s releases always had great titles, like ‘Prayer Meetin’ from ’68. This heavy Hammond Jimmy Smith written instrumental being his more typical vein, all bluesy with a bit of slither. 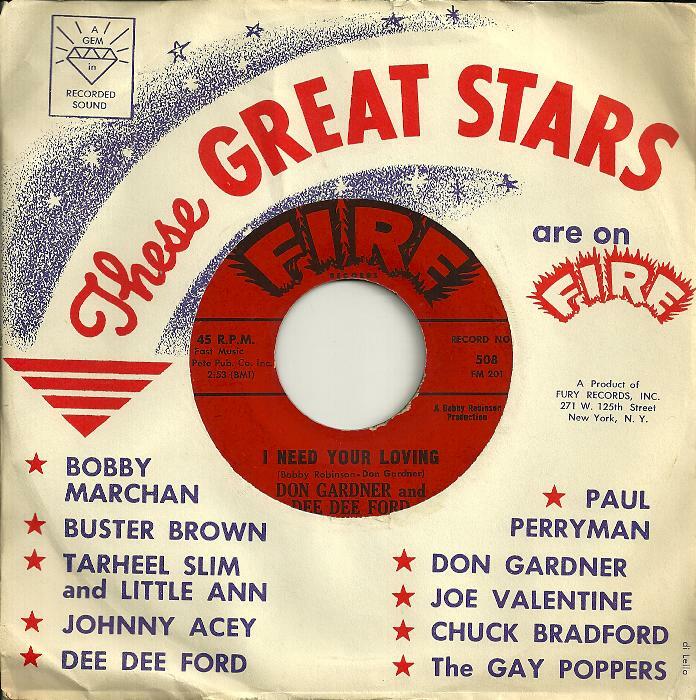 Despite having a Top 20 US Pop single with the edited, cleaner version of ‘I Need Your Loving’ in ’62, Don Gardner & Dee Dee Ford always seemed relegated to the non-priority portion of the Fire label’s roster. 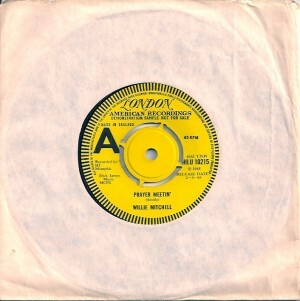 Two further singles, one entitled ‘Don’t You Worry’ reaching #66, were released but still, they were dumped by the end of ’63. 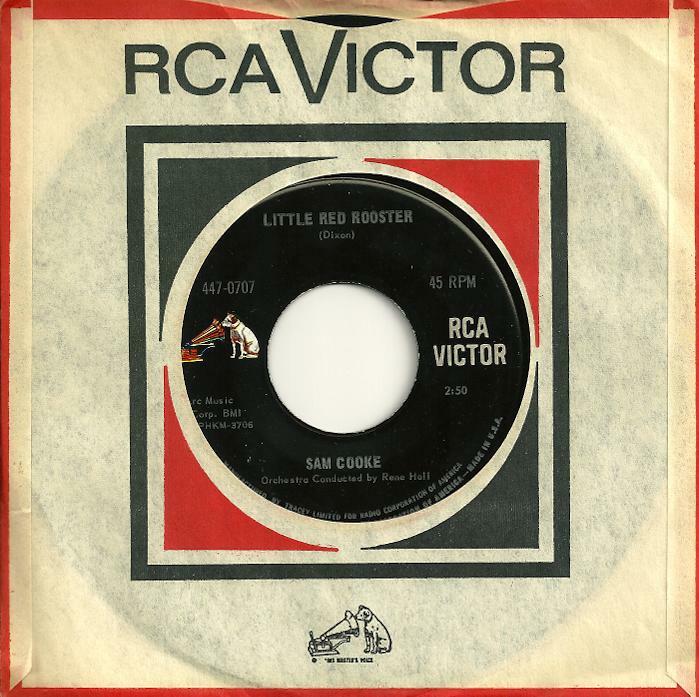 Don Gardner went on record stating he had never earned a cent in royalties from the company, one of the many injustices so common during the period. No surprise then that their presence and coverage on the THE FIRE / FURY RECORDS STORY box set was minimal. In ’49, he put together his first performing band, The Sonotones, with Jimmy Smith of organ. Smith was eventually replaced by Richard Groove Holmes, who left in ’60. 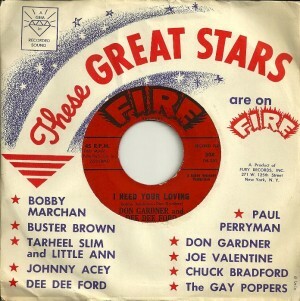 During March of that year, Don Gardner recruited Dee Dee Ford to double on both keyboards and as co-lead vocalist. Their call and response live shows are rumored to have been riveting as can be heard here. The single even managed a UK release on Stateside, with an invaluable deep groove promo pressing that’s basically impossible to top, in my humble opinion. 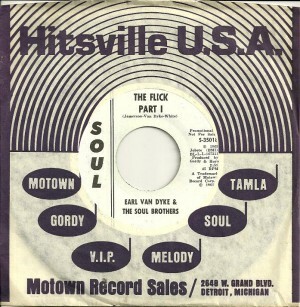 Of Earl Van Dyke & The Soul Brothers’ six Soul/Motown single releases, ‘The Flick’ is one of the lesser known. Sounding very much like the casual late night jam at 2648 West Grand Boulevard that it probably was, Motown’s house band, as they were, or The Funk Brothers, as they became known, got to record some instrumentals under the name Earl Van Dyke & The Soul Brothers. These guys really didn’t like the commercial records they were required to make by day, preferring jazz instead. 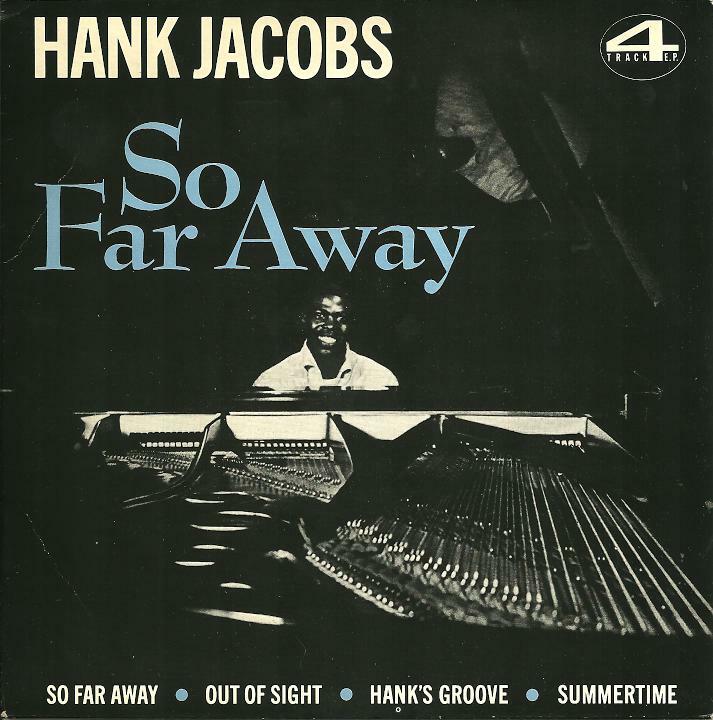 So not surprisingly, these dabbles sound not unlike the Jimmy Smith and Jimmy McGriff soul jazz releases from the period, and make for great jukebox ambience. 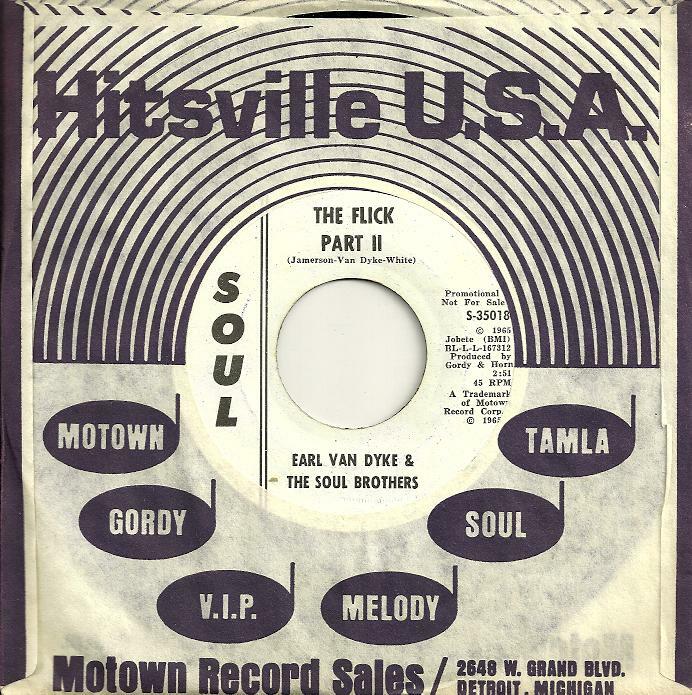 Let me tell you, there’s nothing like a late Sunday afternoon spent digging through a few hundred Motown promos. Happened yesterday, so I can attest. This all started at the Brooklyn Bowl 60′s Music & Memorabilia Show. 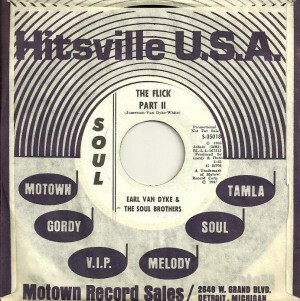 One dealer displayed a Motown white label, and it set me off. To be honest, I’d been waiting a few years to start filing these, Vicki Wickham’s Motown singles, into my wall shelves. It suddenly felt like that moment had arrived. Yes, Saint Vicki. This woman has performed many miracles in my world. As if giving me her record collection several years back wasn’t miracle enough, she out of the blue rang a few days before Thanksgiving 2010, announcing another multi-box discovery in storage. 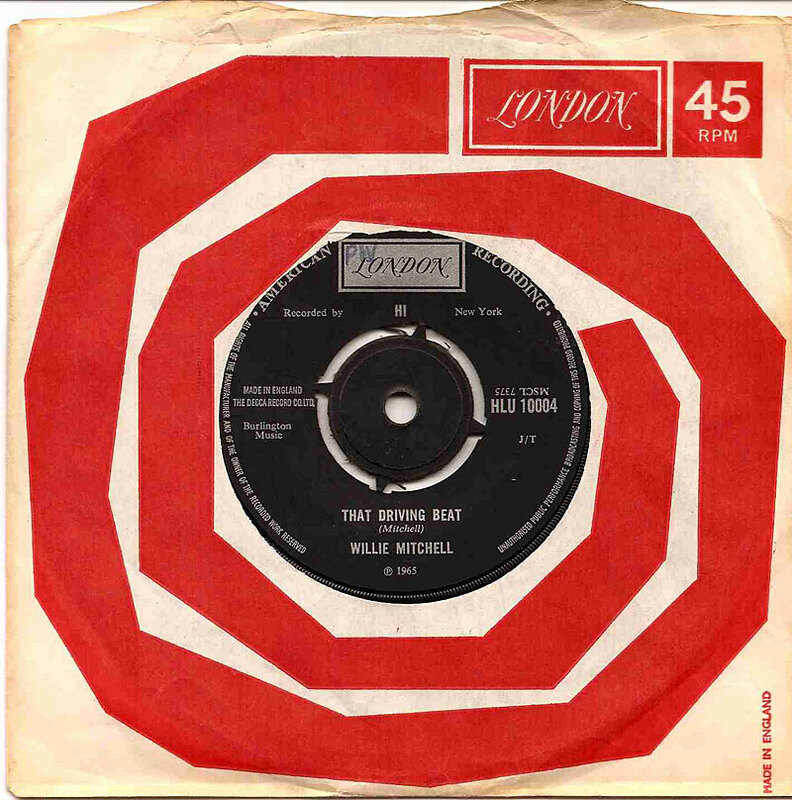 About a thousand singles from her READY STEADY GO days, completely forgotten about for decades. I nearly had to make the trip over to hers in an ambulance. There they were, several white boxes, all stacked, labelled and waiting for me to collect. 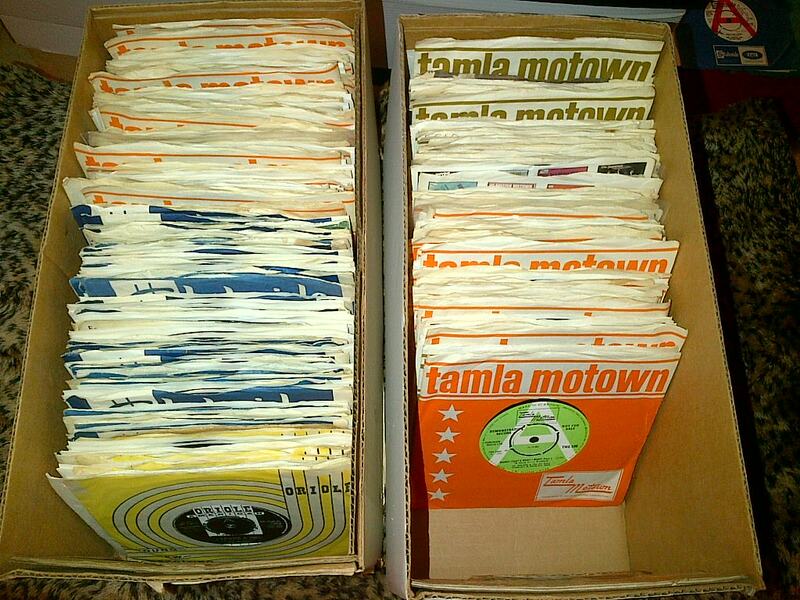 Plus perfectly separated out, a Vicki VIP section: two boxes of Oriole/Stateside/Tamla/Motown. 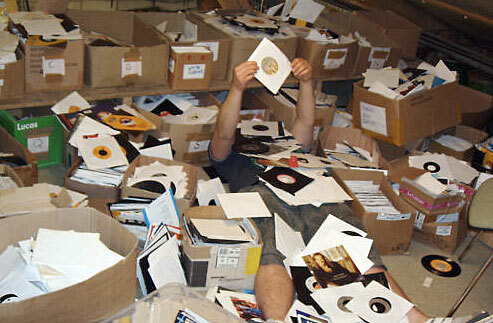 All organized chronologically by label, then catalog number. Now I have tripped out on these many times, even let a few friends have a look through, well Phil and Eric, and that’s about it. Duane wasn’t interested. Yesterday began the process of folding these into the master collection. Playing many and nearly blacking out a few times. No drug has ever gotten me this high. Not ever. Not any. Brother Jack McDuff had an amazing two year run during ’65 and ’66, releasing a total of twelve albums on Prestige. Such was the demand for long playing records, many chocked full with jazzy soul renditions of contemporary hits, all done in a nightclub style. 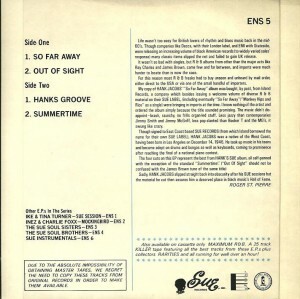 Along side Jimmy Smith and Jimmy McGriff, seems these Hammond mod interpretations were a license to print money. 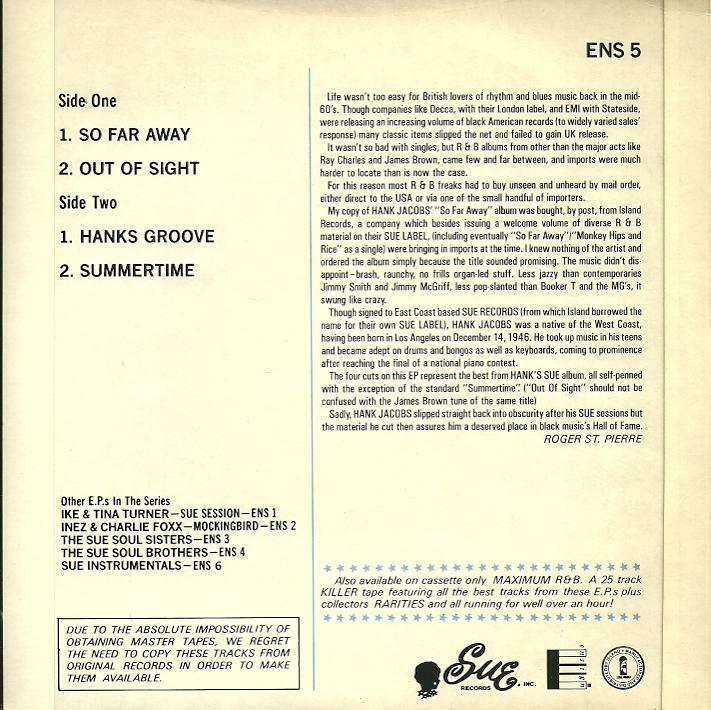 In ’68, under a one time tag, The Brother Jack McDuff Quintet, with David Newman on brass and guitarist Melvin Sparks, he recorded DOUBLE BARRELLED SOUL. 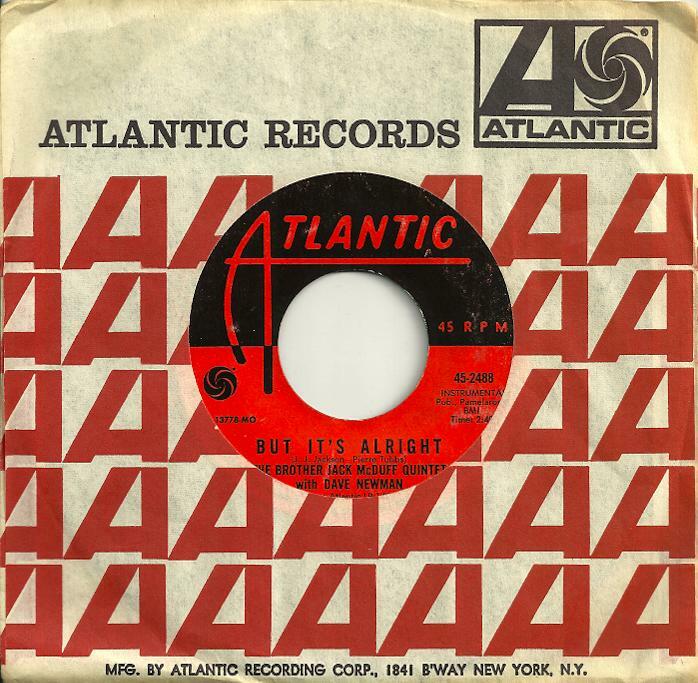 Keeping with the tradition, the project was a grab bag of well known currents including the much covered ‘Sunny’ and J. J. Jackson’s ‘But It’s Alright’. 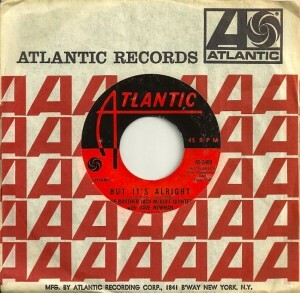 The two were also paired for 7″ release as Atlantic 2488. If nothing else, the record’s superb live drum sound will turn any low key get together into a proper swinging party. Those orange, black and white Sue labels still have an addictive visual to them. Not only the color, but the font too. As do their red and yellow UK counterparts. I can’t pass one up, not ever. Well, when they’re at a reasonable price that is, which is becoming less frequent these days. Best place to find some at affordably would have to be current vinyl stores catering to indie rock. They always have $1 boxes and never seem to have a clue about 60′s soul. I always seem to find at least one. It’s very handy. As with labelmate Jimmy McGriff, these guys specialized in the Hammond organ instrumentals Mods latched onto in the UK, welcoming those releases into their collections along side not only American contemporaries Jimmy Smith and Billy Preston, but also home based copyists, in the most complimentary way, like The Graham Bond Organtization or Brian Auger & The Trintiy. 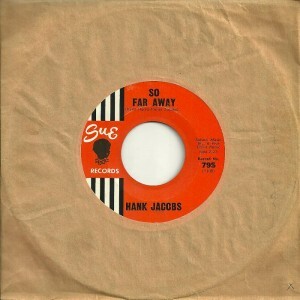 ‘So Far Away’ is admittedly interchangeable with many early singles by those mentioned or Booker T & The MG’s, Willie Mitchell, even James Brown’s Smash label instrumentals. Yet it’s one that I think of first, and seems to have graduated toward the top of an essentials list in general. Why The Shirley Scott Trio didn’t do a James Bond theme escapes me. If ever there was proof of that potential, it’s on this remake of Henry Mancini’s ‘A Shot In The Dark’. Hints of blaxploitation are seeded within this Oliver Nelson arrangement / Bob Thiele production most likely by accident instead of design. From the absolute must have GREAT SCOTT album, the bombastic arrangements almost can’t be topped. Search it out, if only for the fantastic cover shot of Shirley during her classic blond hair dye job gone wrong period of ’64 – ’65. Married to Stanley Turrentine during the 60′s, they shared recording contract obligations, releasing as many as ten albums between them on a yearly basis at one point. Another born again of the Jimmy Smith church, Shirley switched from piano and trumpet to a big Hammond B3 shortly after seeing him live in her home town of Philadelphia. 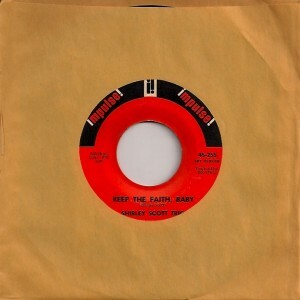 For my palate, ‘Keep The Faith, Baby’ is the ultimate peak of her vast body of recorded work, certainly the 7″ singles. Not only does it live up to the mod jazz tag often associated with her mid 60′s stuff, but it reminds me of how lucky I was to frequent Seattle in the early 90′s, when the town was bursting with used record stores. 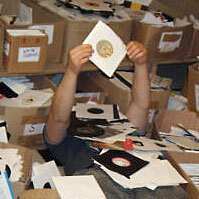 There was a chain, privately owned, specializing in singles, all divided up by genre. I spent hours pawing through those bins. Everything, particularly jazz, was a steal. 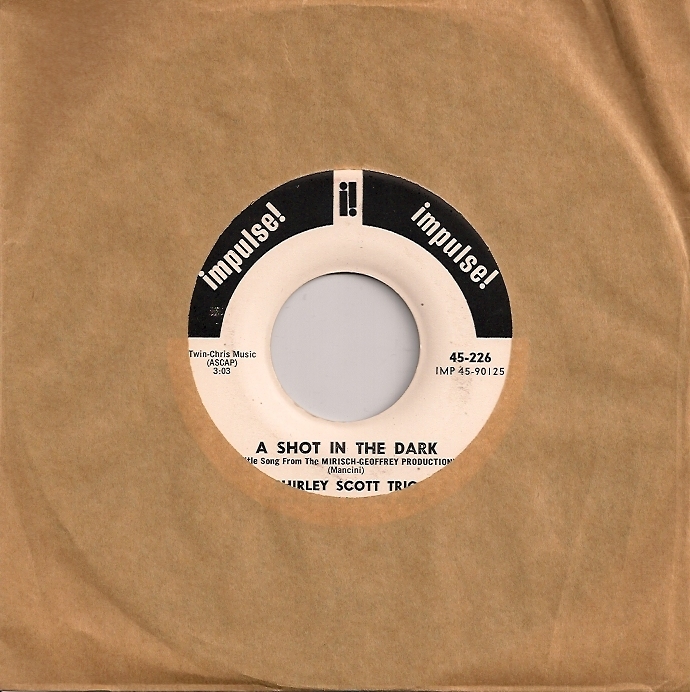 A good portion of my Shirley Scott singles, around twenty, came from those trips. 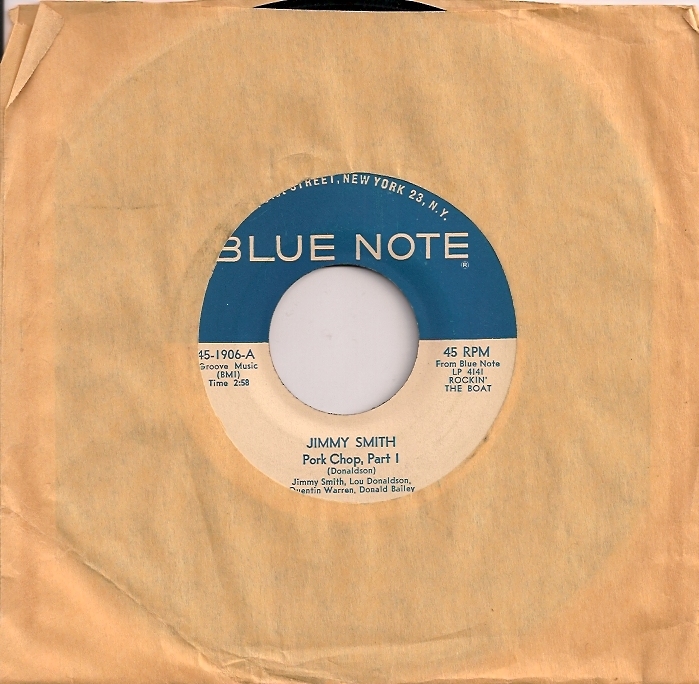 It was very bizarre to me that nobody, including collectors, was interested in jazz 7′s. God, I drooled over them. Thick vinyl pressings on Impulse, Verve and Blue Note were too much to pass up. And I’m glad now that I didn’t. ‘Keep The Faith, Baby’ was recorded on January 13, 1967 at Capitol Studios in New York, again with Bob Thiele producing. It features the ultimate Shirley Scott Trio lineup with George Duvivier on bass and Mickey Roker, drums. 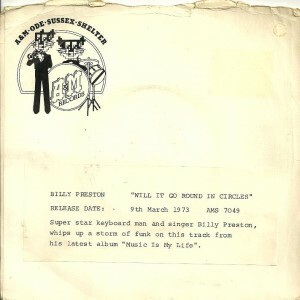 Even if Sam Cooke hadn’t name checked “Billy” at the onset of the organ solo, he, being Billy Preston, would have been on my shortlist of guesses. Jimmy McGriff, Jimmy Smith, Brian Auger, Hank Jacobs to also name a few too, they played in the same Hammond jazz/funk/soul, or whatever it’s called, pocket during the mid to late 60′s. I was not initially attracted to this record, nor Sam Cooke for that matter, when current. 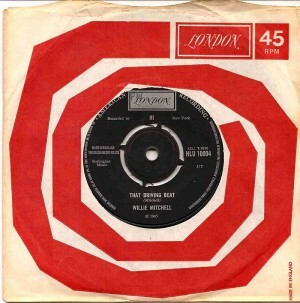 Given the single came out in ’64, and peaked at #11, I’d never heard it. Not until decades later, when rummaging through a Salvation Army pile of discards did this remake of the Willie Dixon tune, a year later (’65) made popular by The Rolling Stones, seem a worthwhile 25¢ gamble. For the longest time, the song’s swing shuffle approach sounded too dated, too safe and too like something my parents would listen to. Just recently did I give it a play and only because this UK promo pressing beauty entered my collection, thank you Vicki Wickham. Boing. How did I not notice the organ playing ever before? 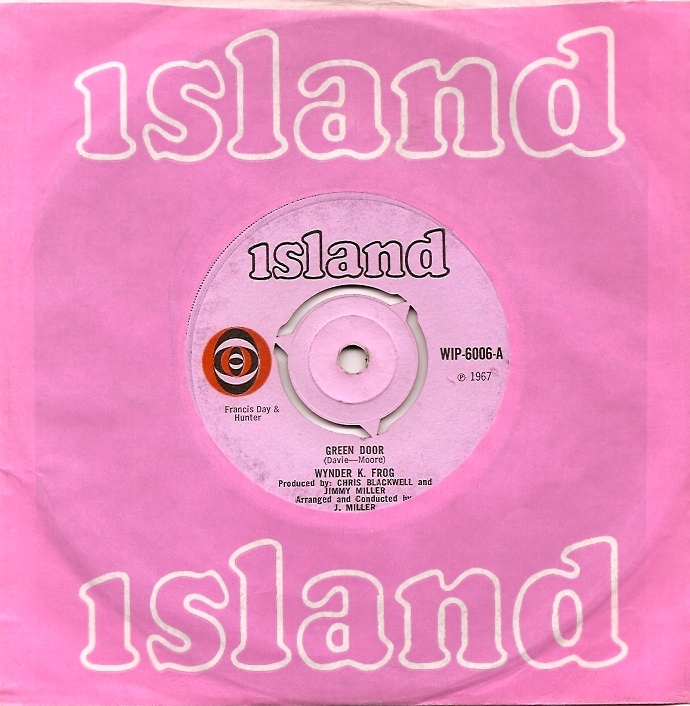 Even as part of the song’s MOR slush style, it stands out. Then that “Billy” namechack had me curious. So my world wide web digging began. Now I’m completely intrigued by the events of December 10, 1964. It was fun Google mapping all of Sam Cooke’s stops that night from his Los Angeles home on Ames Street to dinner and clubs on Sunset to a no tell motel on South Figueroa Street in South Central to the Los Angeles County morgue. Fun stuff. 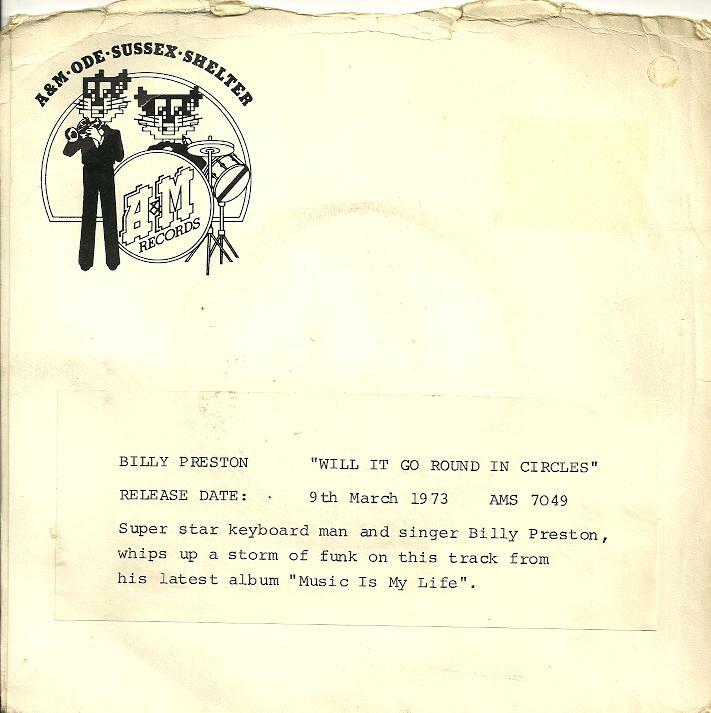 And I found this too, confirming Billy Preston. If you’ve been reading these posts during the last few days, it’s obvious the July 4th weekend leaned prog rock. Our excursion into the depths of upstate New York had me driving randomly through small towns in search of the ultimate garage sale. Look and you shall find, or something like that. We stumbled on two with massive amounts of prog vinyl, about one hundred miles apart. Very unexpected and a bit baffling. At $1 each, it was hard to pass up stacks of valuables that included various Vertigo swirls and Harvest titles. 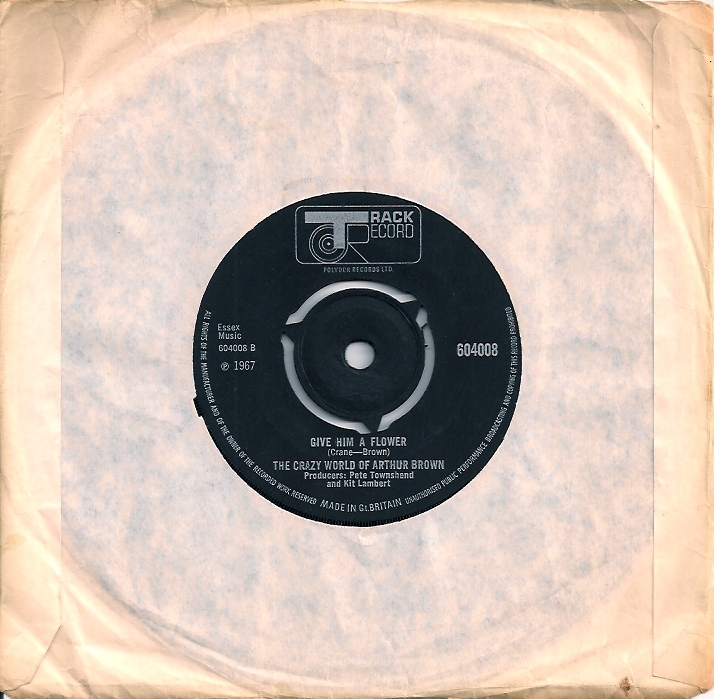 Forget all the lengthy album tracks that littered prog long players, even more bizarre are the 45′s from the genre, all attempting to make playable versions of non-songs into songs. Fun stuff. 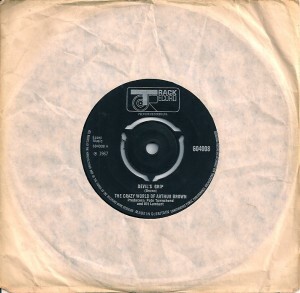 The mid 60′s mod organ style, hugely influenced by both Jimmy Smith and Jimmy McGriff, was still evident on ‘Devil’s Grip’, the ’67 debut single from The Crazy World Of Arthur Brown. 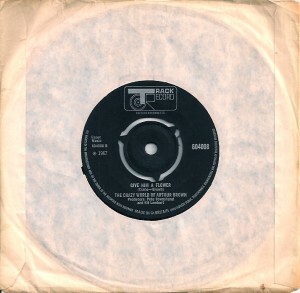 The record tipped toward it’s followup, ‘Fire’, which despite it’s shrill sonic onslaught, became a massive worldwide hit in summer ’68. Turns out Vincent Crane’s Hammond shaped the band as much as Arthur Brown’s voice and theatrics. Their sole album is a struggle to listen to often, if ever, these days. The sleeve was great, and live, the band were a blast, but being perfectly honest meant everyone I knew regretted having laid out the cash to buy it. ‘Devil’s Grip’ may not be the greatest song, but at times, the non-LP track swings more than any other on the album. Way more importantly, B side ‘Give Him A Flower’ is a gem. Borrowing from vaudeville and I’m guessing, coincidentally from The Bonzo Dog Band, the track may be their one and only example of getting a little loose in the pub before heading to the studio, sense of humor in tact. I guess you might call them a supergroup. 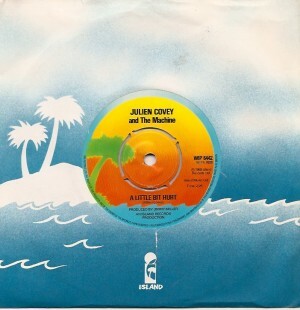 Julien Covey, real name Phil Kinorra, played with Brian Auger in his early days. As well as fronting the band vocally, he also drummed. Amongst it’s members were John Moreshead on guitar, who played with Johnny Kidd & The Pirates, The Shotgun Express and The Ansley Dunbar Retaliation. In addition, the band included Peter Bardens (Them, Camel), Jim Creagan (Blossom Toes, Family) and Dave Mason at various times. 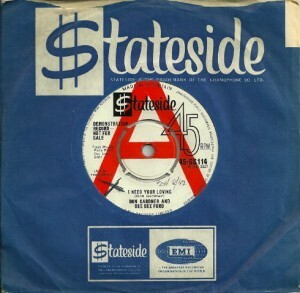 Their lone release, ‘A Little Bit Hurt’, was co-written and produced by Jimmy Miller in ’67, who brought along his freshly used prodcution techniques, successful on The Spencer Davis Group’s ‘Gimme Some Lovin” and applied them to The Kinks ‘You Really Got Me’ riff, to help create this now, Northern soul classic, according the Northern soul classic experts. 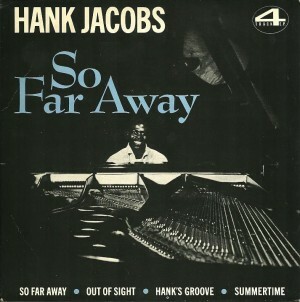 Between ’64 – ’67, the sound of the Jimmy Smith/Jimmy McGriff hammond B3 was the prevalent connection that bridged hip rock and soul, bringing the jazzy black Flamingo club stuff (Brian Auger & The Trinity, Georgie Fame & The Blue Flames, The Graham Bond Organization) to a more mainstream public, as with The Spencer Davis Group. Jimmy Miller’s production played a part. 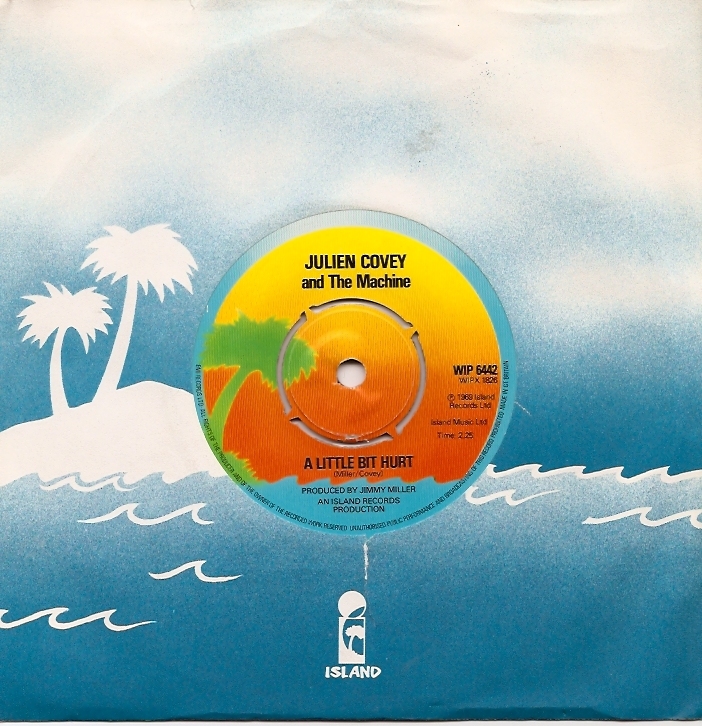 He worked as house producer for Chris Blackwell then and recorded some successful and some less successful, well commercially for the time that is, singles, like the aforementioned Julien Covey & The Machine track, and ‘Green Door’ by Wynder K. Frog. Although not chart records, they became club hits, and apparently still are to this day, on the Northern circuit, wherever that is. It is just not possible to walk away from any Blue Note single titled ‘Pork Chop’. Doesn’t matter who it’s by. Jimmy Smith, credited for having revolutionized the way Hammond B3′s could be played, set the bar for an early 60′s Mod style that was as much a part of that scene as bulls eye jackets. When attacking it wild, he’s sometimes hard to tell apart from Brian Auger or closely named Jimmy McGriff, but a bunch of his singles play ever so smooth, especially on my Seeburg 222, like ‘Pork Chop’. 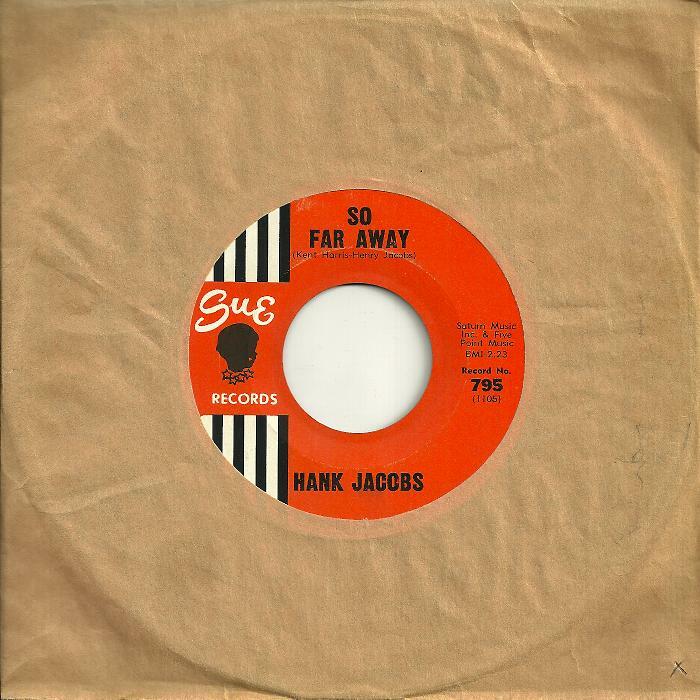 Want to go straight back and pretend you’re at The Flamingo, or a 60′s dive in Harlem very late – just combine a jukebox with this single – and you are there.